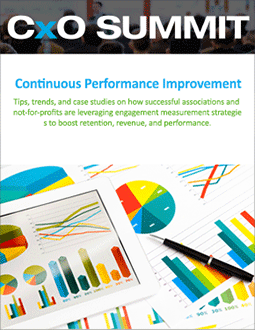 Access the latest tips, trends, and case studies on how successful associations and not-for-profits are leveraging engagement measurement strategies to boost retention, revenue, and performance. The CxO Summit eBook brings you the top insights from ASI's recent CxO events in London, Sydney, Chicago, Washington, DC and other cities. You'll find a summary of the presentations plus links to watch online or download the slides for future reference. Complete the form to receive your complimentary eBook.